Think for a second about where you go on your MTB rides. I bet that most, if not all, run across or adjacent to farmland. Mountain biking is inextricably intertwined with agricultural land – whether it’s singletrack across moorland used for sheep-grazing or linking tracks alongside arable fields – but we don’t often hear what the farming community thinks of us wandering across the landscape. So Mark, how long have you been farming? Where do you do this and what kind of farm do you have? Born and bred on the family farm. Have returned after university/work to run farm together with my partner since 2000. 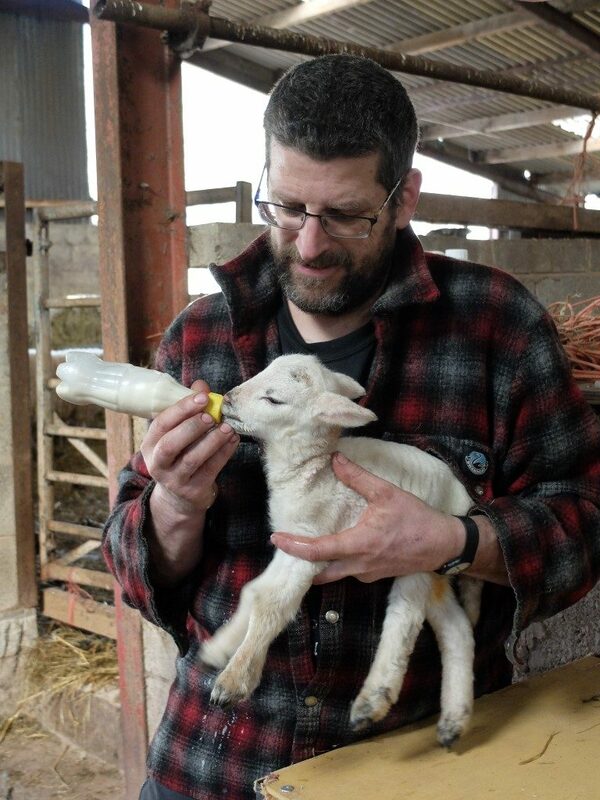 Farm is in the Brecon Beacons National Park and is a hill sheep farm. And have you been mountain biking long? How did you get started? What kind of riding do you enjoy? Always ridden a bike but seriously got into mountain biking about 5 years ago when a friend dragged his old bike out and suggested we went for a ride on the hill behind the farm. Enjoy all types of riding from XC to Enduro but mostly enjoy exploring and taking part in MTB Orienteering competitions. Mark Mogan in action on his farm. All together now: Awwww. This interview came out of an online chat about gate-closing etiquette, so let’s start there. As a farmer, do you want people to leave your gates as they find them? 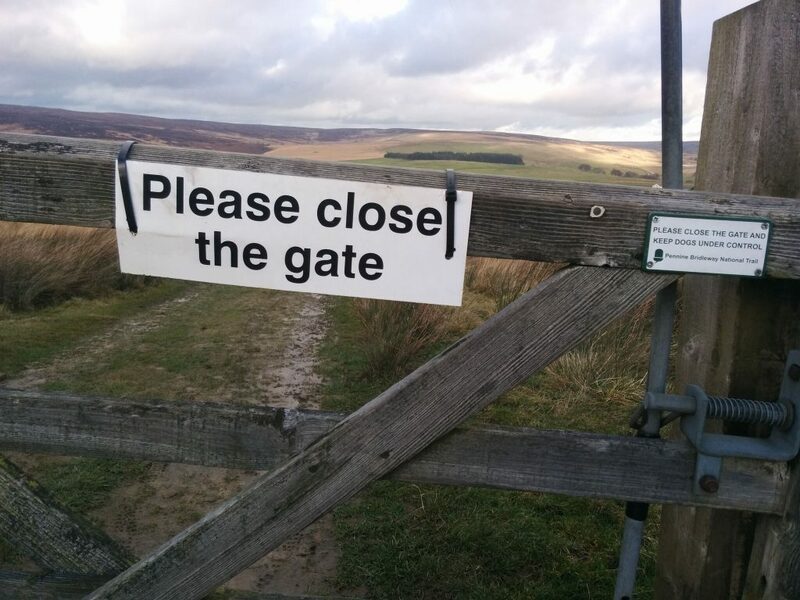 Do you use a firmly worded message if you definitely want a gate closed? Do you tie a gate open if you don’t want it closed? As a farmer I would always advocate leaving a gate closed unless it is obviously fixed in the open position. None of my gates have signs on them asking them to be left closed. If I want them left open I will use string to tie it in the open position. If someone closes a gate it is a small matter for me to open it again on my daily rounds. If a gate is left open that should be shut it may cost me a days work to sort out mixed sheep. At worse it might lead to young sheep getting pregnant when they are too young, which could represent a major financial loss. Would you say most other farmers do the same? Is there a common etiquette? Most farmers would also prefer gates are left shut, even if found swinging (ie. Not tied or fixed open). There is unfortunately no common etiquette. I would say that farmers in the more problematic areas, ie. National parks and the urban fringe, probably share the same views though. Does this tally with the Countryside Code advice to leave gates as found, unless there are specific instructions? Not necessarily. However, the numbers using the countryside have increased noticeably in recent years, in particularly the size of organised groups who seem to be the worst offenders as they often get so spread out the tail enders have no idea that the gate, that has been left open for them, should in fact be closed. Do you find bikers generally understand and follow the “rules”? If they are in small compact groups they usually are no problem. You mentioned before about some farmers feeling put out by large or organised groups of cyclists, can you elaborate? I get the impression from various farmers meetings that most farmers have had some negative experiences with large organised rides, whether meeting groups in narrow lanes while going about their businesses, or from large groups using ROWs across their land having an impact when ground conditions may be unsuitable for such heavy traffic. Now let’s talk about rights of way. Cyclists have a right to use bridleways, but obviously a lot of us also ride on footpaths. My experience is that some farmers don’t seem fussed, while others get very cross indeed. Is there much of a consensus on this among farmers? Most farmers are extremely aware of the status of the ROWs across their ground and while most turn a blind eye to occasional usage would be put out if they thought an unsuitable route (whether ground conditions, crops, animals etc being disturbed) was getting too much use. I very rarely find tracks on my footpaths but having not seen the riders have no reason to be bothered by it. How receptive do you think farmers are to the prospect of wider access for bikes? What do you think cyclists could do to better endear themselves to farmers? If a route is obviously sustainable and links in then there is no harm in approaching a farmer to ask if he minds the route being ridden. Most people are, in my experience, very reasonable to genuine and reasoned requests. However, assurances may be needed and all confrontation avoided if any headway is to be made. Many old paths in the mountains here have been damaged by horses and water erosion so that access by quad bike onto the mountains is getting difficult in places. Offering to make sections more passable to a quad bike (though not necessarily sanitised) may help relations. And as a mountain biker, what would you like farmers to understand about MTBing? I would like them to understand that we are a different group to the ones who ride exclusively on the roads and should not be confused with them 🙂 Most MTB riders IMHO have a deep love of the countryside and truly do not wish to upset the status quo or damage the environment and are more than happy to give as well as take. Anything else you’d like to add Mark? Yes. On another tangent, I am a great advocate of using agricultural payments made to farmers as a means to encourage targeted public access. I think a completely free for all open access like Scotland has is unworkable in the much more densely populated and more intensively farmed southern part of the country. However, a common sense approach to planning joined-up ROWs suitable for off-road cycling that involves existing byways, bridleways, sustainable footpaths, tracks, forest tracks, towpaths etc, together with the odd new track creation here and there could be facilitated using public funds, this being made a prerequisite to receiving agricultural payments of any sort. Can you expand on the use of agri payments for RoWs? Where would a local cycle club look to get started to work with farmers?